Crimsonland Game Review - Download and Play Free Version! Total Carnage! 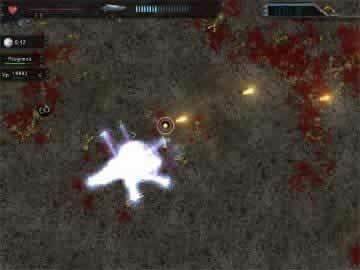 Destroy the swarming alien waves with awesome weaponry or you are fried! Lots and lots of zombies, aliens, spiders and more to kill. More than 20 guns to use. Perks to upgrade your destructive capabilities. Multiple modes of gameplay to keep it interesting. Perks and weapons don't carry over through levels. Level 4.10 The End of All - Total mayhem! In Crimsonland you will face nearly endless hordes of enemies. With unlimited firepower you will have to lay waste to hundreds and thousands of spiders, zombies, aliens and more. You will be able to upgrade your abilities with new weapons, power-ups and perks. This game has only one purpose, ultimate carnage. No time is wasted with a storyline here. Once you start, there is nothing but action as you dodge enemies while blasting them away with various guns. Over 20 guns are available for use and can be picked up while in the levels. Guns such as a plasma rifle or a shotgun are common. You almost always start with a simple handgun and work your way up from there. Each monster you kill gives you experience and every time you reach a certain amount of experience you get to choose a perk. Perks increase things like your characters resistance to damage or add a damage effects to your cursor permanently. Random drops from enemies also give you temporary increases such as fire bullets, double experience, or even a nuke. Crimsonland has several modes of play. You can play in Quest mode which acts like a campaign mode. There are five maps each with ten levels. The monsters you are fighting vary by level. As you progress through Quest mode more weapons and perks are unlocked. Perks are gained by reaching a certain amount of experience. Guns can only be picked up from monsters that drop them after you have killed them. You can normally only have one gun at a time, but there is a perk that allows you to have two. The second mode is Survival mode. Survival mode plays exactly like Quest mode just on one continuous level. Monsters will continue spawning and increasing in number until your death. The objective is to get the high score. Finally, there is Rush mode. Rush mode starts with an assault rifle, but there are no perks or bonuses. The rifle has an endless clip and hordes of monsters will rush you until you die. All modes have the option of multiplayer. Also, there is a tutorial to teach you the controls and how to use perks. The controls are very simple, use the WASD keys to move and the mouse to aim and fire. While the graphics are not the best they are well suited to this game. The only problem encountered was with the visibility of your character. It was possible to lose sight of him making it difficult to avoid monsters. Monsters are all distinguishable and made an appropriate blood splatter when killed. The music is a perfect match to this game and keeps you wanting to kill more and more monsters. Overall the graphics are well suited to the game. Only a few minor problems exist with this game. Weapons and perks don't carry over from level to level. Each time you start a new level you begin with the pistol and no perks and have to work your way back up. This can be frustrating when you spent all the effort in the last level to get the gun you wanted and perks you liked the best. Another drawback is in the perk system itself, some perks aren't always available. Each time you open the perks window it will only show you five or so of the available perks. The perks you want might not necessarily be there. For non stop monster killing action Crimsonland is the way to go. Upgrading your character and finding the next bigger better gun is very entertaining. All the levels and modes will provide endless hours of monster killing delight. The few minor drawbacks don't even begin to really detract from this game. With all the blood and violence, this game isn't suitable for younger players. For everyone else you will definitely have a blast playing Crimsonland. Player created video showing the power of the Plasma Shotgun.